It’s a bright winter afternoon in Middle Tennessee, but shards of sunlight barely infiltrate the bluish fluorescence of the visiting room at the Correctional Development Center — officialese for the Davidson County jail. Jeni Dominelli ‘98 (BA) addresses a motley audience: six inmates in orange and red jumpsuits, and a dozen or so “free-world” folks with laptops, guitars and studiously rumpled fashion sense — the uniform of Nashville songwriters. a “redemption song,” as Jeni calls it, a hat-tip to Bob Marley. “Every songwriter has their own brokenness,” she says, as if to reassure the inmates, We are not so different. No one is judging you. “Amen,” shouts a middle-aged songwriter named Arlos Smith. “I’m a graduate of this institution, by the way.” Then the inmates join their songwriters in groups of two and three at the room’s peripheries, and a buzz of guitar chords and voices stirs the drab cinderblock box to life. Jeni Dominelli, a songwriter herself (pictured above), believes in the power of music to help people reimagine their own life stories — imperfect, but leading toward wisdom. She knows what it’s like to see life skid out of control and to summon the courage to seize the steering wheel. Until it wasn’t. When Jeni was nine years old, Camelot crumbled. Her father was accused of running a Ponzi scheme and convicted of fraud and other charges. Suddenly, Jeni and her mother and sister had nothing, and a media storm swirled around them. Worst of all, Jeni realized that her father was a stranger to her. The anger came later. In high school, Jeni wondered what life might be like with a normal dad, one who wasn’t a felon. The strong faith that had buoyed her compassion for him drained away. Her grades plummeted. She drove to Tijuana on weekends to party with friends. But in her junior year, she thought, What am I doing with my life? This is empty. Jeni vowed to turn her childhood trials into something she could give back to the world. To do that, she’d need an education, so she spent her last two years of high school in the library, with a dream of attending her father’s alma mater: the University of San Diego. Music became her therapy. The classic rock and country her father loved became a soundtrack to her own unfolding history; Kenny Rogers and Journey lyrics spoke to her of new beginnings — like the one she was composing for herself. She mailed her dad verses that put words to a message she hoped he would hear: Your life is redeemable. After USD, Jeni dove into the things she loved most: music and social work. She wrote lyrics for her sister’s country band and worked in a youth group home. Her first a-ha moment came when she was asked to start a music program in a big residential center for teens who’d fallen through the system’s cracks: As she helped them write, perform and record songs, she saw the kids come to life. “It was like you had plugged them in,” she says. “They were talking about things and bonding over music.” Reeling from histories of neglect and privation, these “system kids” had closed themselves up into hard carapaces and could scarcely imagine lighter futures for themselves. But Jeni saw how music cracked them open, in ways that traditional counseling rarely did. When a new director cut the budget — and her music curriculum — Jeni moved to Nashville to pursue her own songwriting career. There, she started a music program at a facility for the developmentally disabled, where the story repeated itself: Jeni saw how playing songs for people with cerebral palsy or Down syndrome tore open a shell. These patients could not unravel the mystery of words, but the language of beats and melodies freed their voices. “They can barely speak, but they can start singing along with ‘Amazing Grace,’” Jeni says. When that program was cut, too, a co-worker told her that she’d found a calling, one too vital to rise or fall with some residential facility’s budgetary tides. She said Jeni should start a music-therapy program of her own. “I don’t start things,” Jeni explained. “I’m a social worker.” But she was unemployed and had little to lose. So more than 10 years ago, Jeni the social worker started something. It began with a pair of ideas: Music can open hard-to-reach people, and Nashville is full of music. The ideas took years to find purchase. She learned everything she could about nonprofits and wooing donors, and launched a few test-run programs on a shoestring budget. Along the way, she struggled to pay the bills. Her sister was diagnosed with severe OCD and her father with cancer. She paused her life to care for them, then suffered her own medical catastrophe — a serious car accident. And then, in 2009, her father died. His story had been one of deceit and carelessness, and of devastating the lives of those closest to him. But his story was also part of Jeni’s, and she had a say in how it was written. Their song, as she saw it, was one of forgiveness and atonement. She remembers their final months together with gratitude — a gift of time they knew to be finite, filled with tears and confessions. “He was really reflecting back on everything,” she recalls. Her faith in him, he said, had been a gift that helped him see the truth of himself, including his failures. As she tells the story now, his gift to her was to break her — disappointing her again and again — until she knew so much about brokenness, she could credibly offer help to the broken. And seeing him try to become the father she’d always wanted, even though he often failed, showed her that redemption was possible, and worth fighting for. Since then, Jeni has turned that belief in redemption into a life’s work. In 2011, she officially launched The Beat of Life, a nonprofit with a mission to bring music and storytelling to people in need: inmates, kids who’ve been bullied and people fighting depression, mental illness and thoughts of suicide. She’s still deep in fundraising and growth mode, and hopes to add programs in cancer wards and addiction treatment centers. Meanwhile, she’s just been hired by Davidson County Sheriff Daron Hall to expand her “redemption songs” program for inmates in Nashville-area jails. 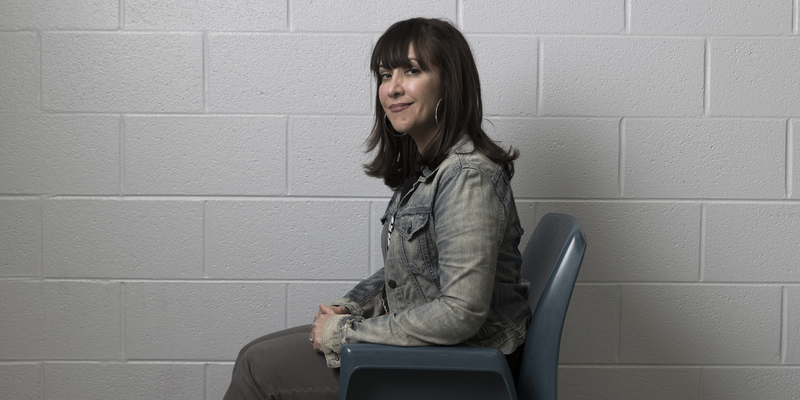 When Sheriff Hall met Jeni three years ago, he saw at once that her vision aligned with his own: to help inmates understand the deep psychological drivers that propelled them toward addiction and crime. “We have a lot of men and women who are incarcerated and oftentimes don’t really know why,” he says. 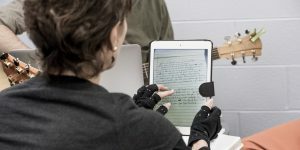 Since then, Sheriff Hall has watched songwriters challenge inmates’ “why” stories in their songwriting sessions together. Early drafts full of blame and denial evolved into raw, honest final takes. 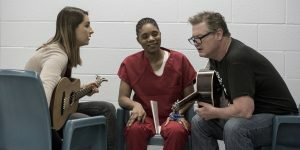 In one corner of the visiting room, 33-year-old inmate Simone* tells a pair of young songwriters a harrowing tale of addiction, abuse and prostitution, as she wipes away tears. She started the day full of shy “ma’ams” and “sirs.” Now the nervous formality is gone, and words tumble out. “Shouldn’t you be typing?” Simone grins during a rare pause. The songwriters laugh … and type. In the middle of the room, songwriter Keesy Timmer strums while TuSabi, in orange scrubs and a scraggly beard, scribbles on a notepad. TuSabi, a musician himself, showed up today with an idea: a breakup song, where the singer tells an untrustworthy lover he is leaving. But the “you” in the song isn’t a person; it’s street life itself. “It’s about how everybody thinks the street loves you, but it really doesn’t,” explains TuSabi. All the while, Jeni zigzags the room. She checks in with a group of three in another corner: Smith and a 27-year-old songwriter named Maddy Rodriguez sing a beautiful harmony on a song called “Mama’s Day Out.” Carmiece, a 39-year-old with tiny braids, follows along haltingly. Her song is about an afternoon when she was allowed to leave jail to visit her nine-year-old son, Jermaine. “She’s getting out in a week,” explains Smith, his eyes filling with tears. “And she’s gonna see him for real on ‘Mama’s day out.’” But this time, the “out” isn’t for a few hours; it’s permanent — or so Carmiece hopes. A cocaine addict, she’s cycled through such institutions for years. Now she wants to stay out and be the kind of mom her son can rely on. Although Smith has been here before, this is Rodriguez’s first visit to a jail. The experience has touched her. “I love that we can take something that’s been hard for you, being away from your son, and make something beautiful out of it,” she tells Carmiece. Jeni says these songs’ redemptive power — for inmates, songwriters and listeners alike — lies in reframing our life stories: By viewing past traumas or mistakes as opportunities for growth instead of stains that define us forever, people are more likely to believe they can change for the better, and to view others as redeemable, too. * First names only have been used to identify inmates.